There is nothing simple about the task facing BlackRock’s dealing teams, who trade for some of the world’s largest fixed income positions. 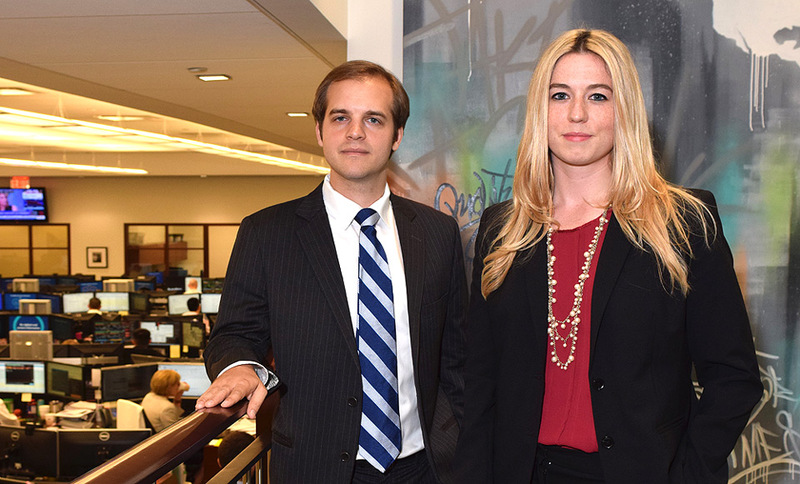 For Izzy Conlin and Bryan Knapp, the smart application of technology, talent and data is allowing them to help manage the complexity their teams must overcome. TheDESK: Real estate on trading screens cannot expand to fit the multiplying tools and data sources; how can that be managed? Where do you see the most complexity in the credit market? Izzy Conlin: Most notable is the fragmented nature of the over-the-counter (OTC) credit market infrastructure. It lends itself to a lack of pre-trade price transparency. Information is distributed in a variety of formats, for example though an IB message, a Bloomberg email, a phone call, or a direct FIX OMS connection. To analyse all of the data in order to derive an appropriate price is difficult. At BlackRock, we are building technological enhancements to navigate this fragmentation. We have set up eTrading committees where anyone at the firm can present an idea for an enhancement with the goal of getting resources for development. For example, we developed an enhancement for piping dealer inventory directly into our own order management system (OMS), Aladdin. Right away, a trader can tell which dealer has an axe in a particular bond so they can go directly to that dealer either via a venue or a “click-to-trade” FIX connection. Instead of having to scrape through email messages or remember a phone call, a trader can see exactly which liquidity provider is involved. To what extent do you think data literacy affects a trader’s performance? Bryan Knapp: It’s very important. We have so much information available to us that a trader would be remiss for not leveraging it. On the futures side the majority of our brokers provide total cost analysis, however, as part of our trading team, we have a trading research team that looks at expected cost on a pre-trade basis, and implicit and explicit execution costs on a post-trade basis. You need to marry what you are hearing and seeing anecdotally with the hard data, so that you can make informed execution decisions going forward. The feedback loop among traders, trading research and PM’s is critical in optimising the best results for our clients. Izzy Conlin: We have an incredible trading research team within the Trading, Liquidity and Investments Platform. They build expected cost models that we utilise daily, monthly and quarterly to examine trader performance. In corporate credit, we might look at which protocol we used for a trade of a certain volume, or would it have been better to hold off in executing the trade until after an important economic data announcement, or how many of our trades were electronically processed in a given month versus executed manually through voice. From a buy-side perspective, having a research team within trading is fairly unique and it sets us apart from our competitors. How does that interaction affect the team on the desk? Izzy Conlin: It’s very valuable. Everyone is versed in data and understands expected costs versus implementation. We borrow metrics from the equity world, such as implementation shortfall, to look at trader, counterparty and investment team performance. We can slice and dice this data in any way that we so choose and it helps traders make smart decisions. How would you characterise the evolution of skills on the desk? Bryan Knapp: Emerging traits are a willingness to adopt new technology, new processes and ways of thinking, but also technology literacy in general. Having a little bit more knowledge about how FIX protocol works, about how my OMS is communicating with my EMS and how my EMS will communicate with a broker’s systems, allows a trader to partner with our technology partners that have been growing in importance to the trading process. Providing our technology partners with the business rationale behind a specific execution workflow or style, helps in quickly resolving outstanding technology issues and also helps to develop superior technology solutions that will enhance our trading platform. Izzy Conlin: The new generation of traders are more skilled from a technology perspective. Diversity of thought and diversity of skill-set within a trading desk, no matter what asset class you are trading, is extremely valuable. 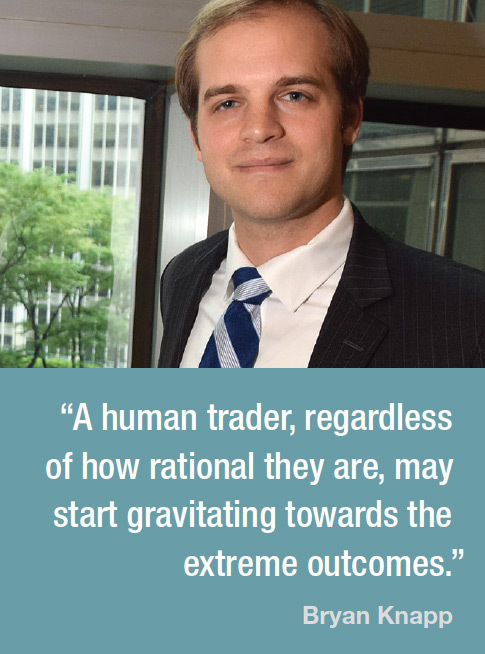 Our trading desks include experienced traders who have lived through many volatile credit cycles, as well as younger millennial generation traders willing to push the status quo. Many of our traders become specialists in a particular protocol or platform, and know when to utilise a more high touch trading approach versus a low-touch electronic trading approach. Does that add complexity to management? Bryan Knapp: There has been a real focus in achieving synergies between those different skill-sets. To the point where there are established internal committees for knowledge sharing, exchanging ideas about what additional venues we should be looking at, or how we can enhance our technology or access to liquidity. We feel that bringing many different skill-sets to the table will ultimately help drive our trading platform forward. How is the level of auto-quoting in treasuries affecting execution quality and performance? Bryan Knapp: Over time it’s become more ubiquitous and it certainly seems that a number of our dealers are looking to auto-quote up to some relatively substantial sizes. We have a number of rules-based trading processes set up within our system so that orders that meet specific criteria are automatically routed out to an auto-RFQ programme. With the dealers’ automated pricing systems on the other side we can very rapidly price these trades with minimal slippage to arrival, so long as the prices we receive back match our execution criteria. Auto-quoting has really enabled us to receive objective pricing, and as the dealers have upped their technology, we have been able to move forward as well. Have you learnt any lessons from reading data via systems that as a human trader without that enhancement you would not have seen? Bryan Knapp: It really shows you to be wary of the biases associated with anecdotal evidence. Every now and then you get a call from dealer X saying, ‘We have decided to step up pricing,’ or ‘we have integrated new technology which should improve our auto-quoting logic, and within the next couple of months you should really see an uptick in our performance.’ A human trader, regardless of how rational they are, may start gravitating towards the extreme outcomes, instances where the dealer performed very well, or very poorly. There may also be a tendency to under or over-weight a dealer’s past performance. The trading matrix allows us to understand the performance over an extended period of time to make us make better decisions, and to see how dealer performance is evolving. Are there real world examples of how that impacts dealer relationships? Bryan Knapp: If we get a new dealer online, or an existing dealer wants to improve their ranking, they might provide really aggressive pricing for that quarter. But after a certain period of time they might start to step back from this more aggressive stance. So we need to understand how dealer pricing is evolving over time, as we have found that pricing performance may not be a constant. 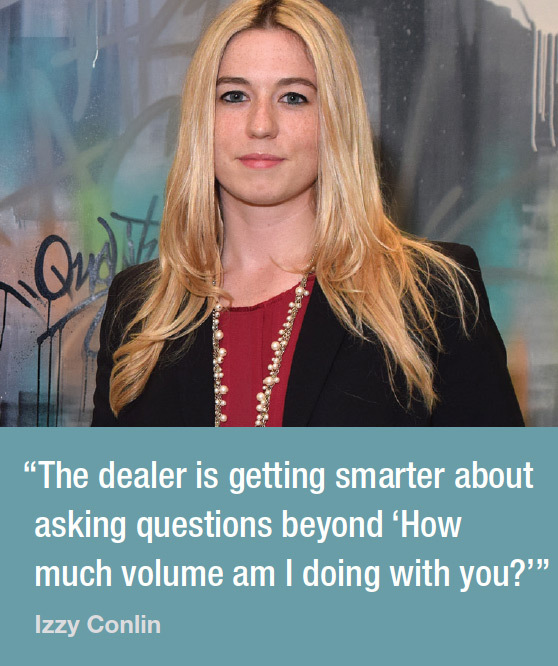 Izzy Conlin: The dealer is getting smarter about asking questions beyond ‘How much volume am I doing with you?’ which may have been the only question that they would ask in the past. Now, they look at the relationship more holistically, seeking to be not only the best in volume, but also the best in technology enhancements, electronic execution, RFQ speed of quoting, algorithmic trading, and venue participation. We still analyse a dealer based on performance in block size trading, or volume by rating or maturity, but we also take note of their participation on electronic venues and whether they are contributing to the market structure ecosystem dialogue. Enhancements and improvements to the fragmented OTC infrastructure for corporate credit will only occur with co-ordination and collaboration between both the buy-side and sell-side communities. Do you think negotiation skills are challenged on the buy-side desk? Bryan Knapp: Ultimately our job is to facilitate order execution within the guidelines of our best execution policy. For instance, in fixed income futures we want to make sure that we have flexibility in the execution tools available to us. So if a PM is trying to implement a strategy where they want to try to achieve passive fills because they are concerned about their opportunity costs, we are able to facilitate that. Alternatively, if the PM is instead looking to transfer risk as quickly and discretely as possible, we can facilitate that as well through a different set of strategies. In treasuries, where we primarily leverage the RFQ model, it may be more difficult to replicate certain order types (e.g. Limit, Stop-Limit orders) using more traditional means. As a result we will look to different platforms and execution protocols to ensure that we have effective means to implement a variety of strategies appropriately. How do you see your counterparty universe changing at the moment? Bryan Knapp: The vast chunk of dealers on Tradeweb are the same ones that were available in 2011. In futures, over the past couple of years, we have seen some dealers play catch up on low-touch products, providing us with simple direct market access, out-of-the-box algo suites, and, in some instances, customised algo solutions for specific execution workflows/tasks. We definitely have our ear to the ground in terms of what’s out there; new platforms, new execution protocols, new agency offerings, but at the same time we need to take into account a broader, more holistic view of our trading relationships, not just what a potential counterparty can provide in a specific product. Izzy Conlin: Counterparties’ business models are becoming more agency-based, so there are opportunities for other types of liquidity providers to be market makers. Any sort of counterparty or pool of liquidity that offers us competitive pricing will be looked at no matter what the asset class. In corporate credit, all-to-all trading has opened a whole new channel of liquidity where the buy-side can trade directly with the buy-side if it suits each participant. Can the number of choices create complexity in the liquidity and price discovery process? Izzy Conlin: As long as we can absorb the information properly and efficiently, more liquidity providers is probably a good thing. The key is having the ability for the trader to see the information in a standardised and efficient manner. Does having a large passive portfolio allow you to make prices more effectively, because you are trading and pricing differently than you do for active funds? Izzy Conlin: The buy-side is not in the business of being market makers, but we can be price makers if it suits our portfolios. There is still work that needs to be done from an efficiency and data standpoint to allow other liquidity providers, that aren’t necessarily a bank, to enter into the market and be a price maker, or declare the price that we are willing to trade at. Izzy Conlin: I could see us getting to that with more technology and data aggregation, but you would also need a massive shift in behaviour from the traditional asset managers in terms of price making. I am not sure we are quite there just yet. Which utility would you like to see invented? Bryan Knapp: More support for electronic trading in the off-the-run space in treasuries. Izzy Conlin: I would like to see a centralised place in which participants can trade. I don’t want to use the word “exchange” because I do not think you are going to see bonds be exchange-traded. However, some way to aggregate all data points and axe information in one centralised place would be an interesting development. 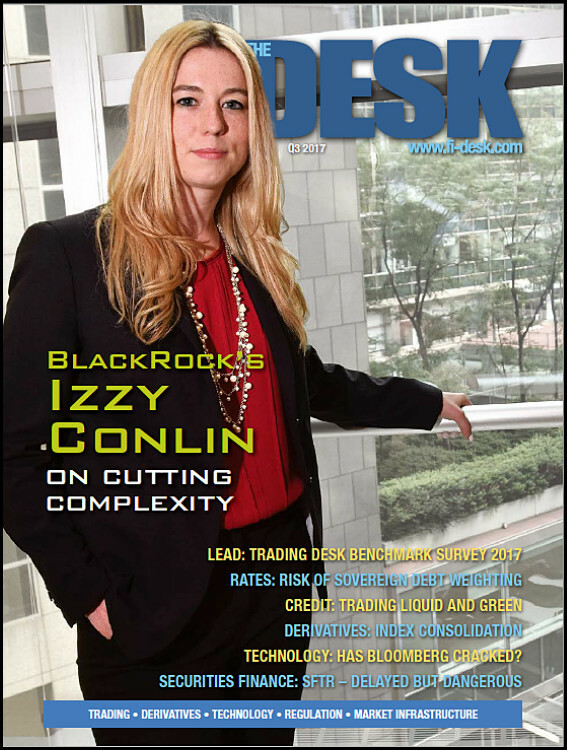 ♦ Iseult (Izzy) Conlin is an investment grade bond trader at BlackRock, handling USD financials and industrials trading in the front-end. She is an eTrading credit product lead manager and has been instrumental in the development and adoption of an open access, all-to-all, electronic credit trading platform. ♦ Bryan Knapp is vice president in the treasuries and futures team at BlackRock, having joined the firm in 2011 as an analyst intern. He coordinates across trading research groups and the trading desks, working on development of tools for to support trading execution and analysis.